Light indoor, indoor penetration and deep indoor with LPWAN is yesterday’s news. The new record for the penetration through walls and floors was achieved in Munich on August 10, 2018 with NB-IoT. 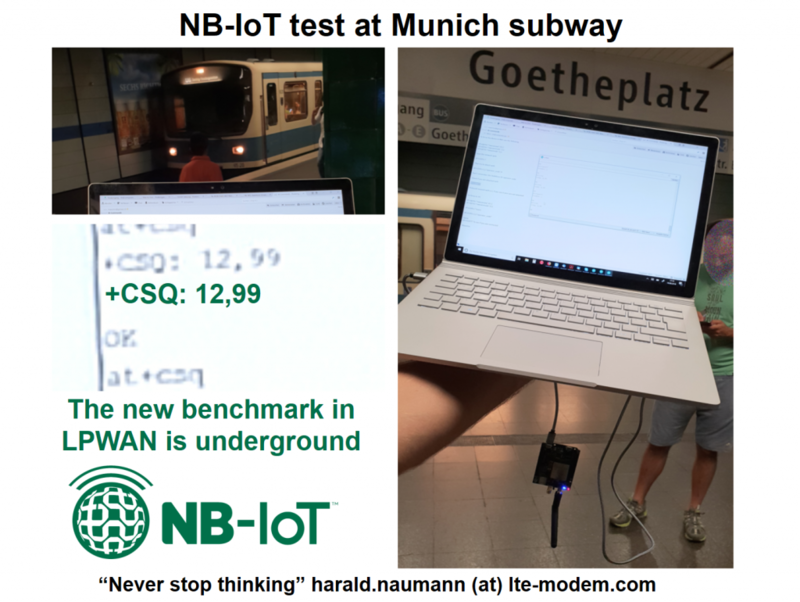 Due to the great heat in the office, our Munich team continued the NB-IoT tests in the Munich subway tunnels. With NB-IoT you will be able to receive a signal in the tunnel of the subway. On the photo montage, you can see +CSQ: 12,99 as the output of the terminal program. The formula is -113 dBm +2 dB x 12 = -89 dBm. The field strength at Goetheplatz station varies between -89 dBm and -106 dBm. According to the datasheet, the receiving limit is -129 dBm. At 10 dB more (i.e. -119 dBm), there is approx. 6000 bps according to the diagram. At -109 dBm and more we reach approx. 21 kbs because this is valid to a link budget of better than 144 dB. At -89 dBm receiving level, the NB-IoT module will surely regulate back its 23 dBm transmission power. -129 dBm is necessary to reach the maximum link budget of 164 dB. With -89 dBm we are 40 dB above the minimum. The selected antenna during NB-IoT test is a monopole and therefore dependent on the size of the ground plane of the PCB. Due to the antenna’s positioning close to the ground, the near field of the antenna is already cut. This is not good for the radio wave and leads to higher losses. The NB-IoT module still receives a very high signal in the subway tunnel even at ground level. Further tests will follow. Interesting are tests at eye level of a terrier, a police shepherd dog, a ladies handbag and after Hata Radio Propagation (1.5 meters) in the tunnel of the subway and above ground on the street. This can then be used to calculate the loss of radio energy due to road pavement, soil and steel reinforced concrete in the subway tunnel. 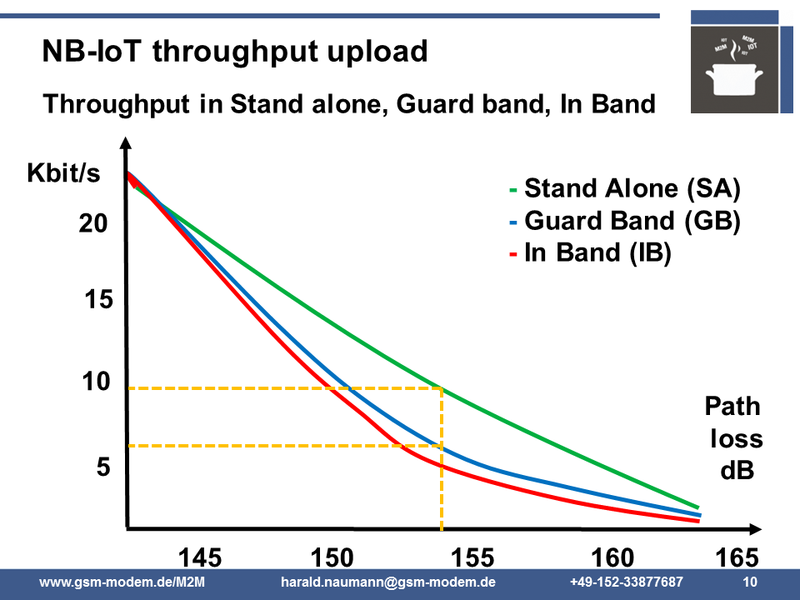 Munich is a very interesting location for tests and comparisons of the well-known LPWAN. All important LPWAN technologies are represented in Munich. SIGFOX refers to network coverage, but sadly no locations or density of gateways. You can easily determine this by activating a SIGFOX-Eval-Kit and visiting some public buildings in Munich. Choose the floor so that the city limits of Munich are covered, or the coverage according to the network map. The buildings can be selected on Wikipedia (Wikipedia, 2018). Then the locations are transferred to Google Maps, a screenshot is made, transferred to PowerPoint, circles are drawn, the radius is determined and at the end calculated backward with the Hata Radio propagation. With an estimated 156 dB link budget for SIGFOX, the range of the radio wave is probably primarily dependent on the earth’s curvature and the chosen floor of the 90 to 150 metre high buildings. Once the points for emission have been determined, you are on your way. It would also be possible to drive around by car and send messages. Since SIGFOX is limited to 1 % duty cycle, you can only send a message every 10 minutes on average. The transmission via the high buildings is probably easier. Determining LoRaWAN in Munich is easy. There is no public LoRaWAN in Munich right now and therefore no coverage for our Terrier, German Shepherd or the ladies handbag. However, the LoRaWAN of public utilities is mentioned for completeness, which has announced 10 LoRaWAN gateways. In addition there is the intention to to launch a public LoRaWAN. (Gust, 2018). We divided the area of Munich by 10 to calculate the average area per LoRaWAN gateway. This area was converted into a circle and projected onto the map of Munich. The map section was taken from the online map of the Bundesnetzagentur. The Bundesnetzagentur in Germany shows all base stations of cellular network operators and the height of the antennas. Each orange triangle stands for a base station of the three German network operators (Bundesnetzagentur, 2018). There are several ways to determine the number of NB-IoT locations. The NB-IoT modules display the cell ID via AT command. Subway tests are perfect for limiting the range of base stations. The base station will probably no longer be reached at the next railway station. The NB-IoT-tests were done in the railway station Goethestraße because this was the closest to our office. We had a signal in the office and courtyard. The station on Goethestraße has a total of four stairways. This makes further interesting tests possible. Our office has an underground car park. In the driveway, you can make phone calls with your smartphone. It would now be interesting to know how far back we can still transmit by NB-IoT in the underground car park. The silver bullet for location search and measurement is the NB-IoT test system with a customised version of the akorIoT Micro on Quectel BG96. Our customer has been developing radio network test systems for cellular network operators for over 25 years. They hold Qualcomm’s licenses for reading the lower software layers and can evaluate a great deal of data. I will borrow such a test system and measure the NB-IoT network in Munich. The mid-range version of the NB-IoT tests uses the new akorIoT SensPRO. Besides the multimode module Quectel BG96, the SensPRO holds a GNSS module Quectel L76 and a RAM memory on I2C. The SensPRO can be freely programmed with the Arduino SDK or ATMEL Studio. The interfaces have been disclosed. Everyone receives a programmable NB-IoT data collector for 149 Euro. Since the SensPRO is the size of a credit card, it is also a freely programmable tracker for the terrier, police dog, handbag, container, toolbox and much more. In addition to NB-IoT, the BG96 can also use GPRS and LTE-M. If no NB-IoT is available, a SIM card with roaming will be able to register with the cellular networks of all operators in Munich. Almost all orange triangles in the map above are available for connections to the cloud server. “Waldi” and “Lassi” can, therefore, be found everywhere in Munich or even in foreign countries. Do you want to test and compare NB-IoT or SIGFOX in Munich? Do not hesitate to order an akorIoT SensPro and test it first while enjoying a free coffee in our office. Then it is time to go to the subway station at Goethestraße, and from there you can continue to other places in Munich. Interesting places to visit are those which according to the coverage map have no coverage, because I expect coverage at these places as well. We would be happy to arrange a tour for you. At the end of the tour, an NB-IoT live test can take place in one of the popular Munich beer gardens. We would be happy to invite you for a beer, exchange experiences and book a hotel near the subway station Goethestraße. If you are interested in an antenna matching, a customised antenna or a development of a whole IoT device, do not hesitate to contact us. Furthermore, the akorIoT team is happy to hold workshops on the customer’s location for decision making. Feasibility studies, prototypes with function or consulting are also part of the services. Bundesnetzagentur. 2018. EMF database. [Online] 12. 08 2018. https://emf3.bundesnetzagentur.de/karte/Default.aspx. Gust, Stephanie. 2018 .Newspaper for Municipal Economy. 04.06.2018. [Online] 04. 06 2018. https://www.zfk.de/digitalisierung/smart-energy/artikel/muenchen-bekommt-lora-netz-2018-06-04/. Wikipedia. 2018. Wikipedia. List of the highest buildings in Munich. Online] 11. 08 2018. [Accessed: 11. 08 2018.] https://de.wikipedia.org/wiki/Liste_der_h%C3%B6chsten_Bauwerke_in_M%C3%BCnchen.